In Attack of the Clones, we finally get a relatively definite distance and an easily deducible travel time out of the same situation. Upon learning that Obi-Wan is in danger on the planet Geonosis, Amidala and Anakin depart Tatooine to attempt a rescue. Amidala argues that they can arrive much faster than any Jedi force from Coruscant, given that Geonosis is "less than a parsec away." Before declaring ourselves halfway home, though, a word of caution is in order. A parsec is a derived unit of distance used in astronomy. It is decidedly Earthbound, and thus conceivably a bit arbitrary. As you (should) know, the term itself is a contraction for parallax-second. Parallax refers to the apparent change in position of an object, thanks to the observer moving a certain amount. For instance, if you close first your left eye and then your right, you'll note that objects around you seem to move ever so slightly, and the effect is greater the closer an object is to you. In the context of astronomy, the distance between the eyes, and the distances to the closest objects, is a bit bigger. The entire orbit of the Earth is used, which would be like having your eyes 299,200,000 kilometers (i.e. 2 AU) apart. The distances to the closest stars is so far, though, that even with such spread between observation points the apparent direction shift is so small that it is measured in those minute fractions of a degree known as arc-seconds. Hence, parallax-second, or parsec . . . the distance of an object whose astronomical parallax equals one arc-second as seen from Earth. The distance of a parsec works out to 3.262 light-years here on Earth, but if we were Jovians we might define it as the parallax as seen from Jupiter, in which case it would be 16.96 light-years (or, more correctly, light-Earthyears). On Mercury, it would be just 1.24 light-years. However, it is assumed for our purposes that in the Star Wars galaxy units of measurement are basically the same. For instance, one would expect in this case that the term "parsec" is either exactly the same, or that it is derived from the orbit of Coruscant which is presumably similar, if not equal, to ours. So, bingo . . . we're halfway home. Now, all we need is the time it took Amidala and Anakin to get there. Previously, I'd guesstimated this value based on the approximate time it would take for the events which occur between their take-off and their landing to happen, with the major one being what occurs in the Republic Senate in what seems to be a special night session . . . a vote on giving Chancellor Palpatine emergency powers, which occurs after a speech by Jar-Jar. The Jar-Jar speech alone could've taken decades, but I nevertheless guessed that everything took about six hours. The Senate voting scene is preceded by this establishing shot of the Senate, obviously sometime at night, with the clouds above lit by at least one of the at least three moons of Coruscant. Clearly, that is not quite nighttime, and not quite daytime. That leaves us with the possibility that it is either dusk or dawn. In either case, though, the trip to Geonosis is well-framed by events on Coruscant, and we thus have a rough timebase to work with. So far, though, that isn't much to go on. We have, as a rough Coruscant end-point to the Tatooine-Geonosis travel time, a Senate vote occurring sometime during the night. That means it could happen anywhere from relatively early evening, all the way up to the wee small hours of the morning. And, we have a start-point to the trip which could be either dusk or dawn. The issue of the time of night for the Senate vote cannot really be answered . . . I'll assume it to be about 9pm local time, which is close to dusk (so as to make the travel time shortest), but late enough to make it truly nighttime. However, that's still a wide stretch of hours to play with, depending on whether we see dusk or dawn above. Which is it? Aye, there's the rub . . .
Before we begin, it would be best to point out a few things. First, it is assumed that the length of a day on Coruscant is approximately equal to the length of a day on Earth, and that, specifically, the length of actual daylight time is roughly the same. Since, of course, this figure is different depending on where you are (i.e. if at the poles, a day can last six months), I'm making the Eurocentric assumption that the major features of Coruscant are in the temperate zones of the planet . . . not too close to the poles, and not too close to the equator. I'm therefore employing an average time-of-daylight of 12 hours (though this can vary by by as much as three hours either way depending on where you are in (for example) the United States, and whether it's the summer or winter solstice). Second, it would be extremely helpful to be able to establish that the major features of Coruscant are all at least roughly in the same longitudinal time zone. This need not be so. In Star Trek, for example, Starfleet HQ is in San Francisco, while the Federation president has his office in Paris, France. An admiral on his lunchbreak deciding to call up the president could interrupt the president's dinner. Evidently, such is not the case on Coruscant (which, in a transporter-free society, makes some sense . . . hence specific capital cities on Earth). Note the scenes in The Phantom Menace on Coruscant . . . Anakin tries to visit Amidala during daylight, Amidala calls for a vote of no confidence at the Senate in daylight (as shown in the Senate screencap above) . . . Anakin is tested at the Jedi Council at sunset (as related in both film and script), and the film shows the sun setting as Amidala has returned to her quarters shortly thereafter . . . Amidala and Palpatine converse in the encroaching darkness, and then we see Yoda and Qui-Gon arguing Anakin's future at night. This suggests a fairly small distance of no more than an hour or two of time-zone difference, if even that much, between the Senate and the Jedi Temple. Similarly, AoTC shows us a similar lack of time-zone difference between the Jedi Temple, Palpatine's office, and the Senate when Anakin goes from one to the other to the suites for the next with no apparent discrepancy in daylight. (The AoTC novelization makes this even more explicit, pointing out that Senatorial apartments were all around the area of the actual Senate structure, and that evening was the same both for the Senate itself and for the Republic Executive Building housing Palpatine's office.) Similar scenes abound, suggesting that one can employ a concept of "Capital Time" (referring to the timezone of the actual offices of Republic government on Coruscant) with good confidence. And so, with the notion that the major features of Coruscant are relatively near one another, let's see if we can determine what the time of day was when Amidala and Anakin launched toward Geonosis. The above scenes occur immediately following the couple's departure, with Mace Windu and Yoda still standing in the office. The scenes are noteworthy because we can quite easily see the angle of the light on the buildings and clouds behind the characters. Whatever the time of day, the sun is off to the left. Now what is needed is the ability to determine where the sun rises or sets, as seen outside Palpatine's window. We do get a couple of additional scenes in that office, and they do allow a determination to be made. First, at the start of the film, Amidala's senatorial flying wing lands at dawn. This is identified as dawn in the script, and we are told in the novel that the landing pad is near her Senatorial apartment building. One can also see the fact of dawn from space on the face of the planet as the ship approaches, and based on the low angle of light on the buildings and the shadows cast on the fog as the flying wing descends toward the platform. The scene following the assassination attempt is in Palpatine's office, and involves a meeting with the Loyalist Committee. Amidala, clean and in new clothing, enters the office during this scene, and that plus the virtual lack of fog suggests at least a little time has passed. This, in and of itself, is not all that helpful, since it could be late afternoon at this point, or the equivalent of 10am. In any case, note that the light angle is again showing the sun to the left. The lesser canon is undecided on the timing of this scene. 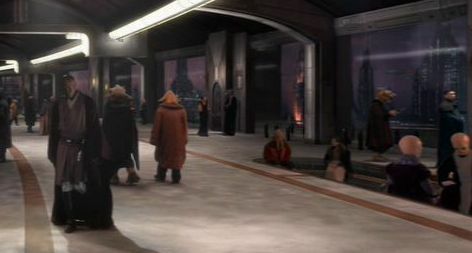 In the script, there is an afternoon Senate scene preceding the above scene in which Amidala shows that the reports of her death are exaggerated, and the lateness of the hour is mentioned. The scene above is thus suggested to be late afternoon, though the script simply identifies it as "day". Meanwhile, the novelization takes the view that the afternoon Senate scene occurred the day prior, and that the scene above is the morning of the next day. In any case, the Senate scenes were specifically removed by Lucas (as mentioned in the deleted scenes section of the DVD), and the logic of the film suggests it should be the same day, and even the same morning . . . one would not expect Amidala to fiddle about for over 24 hours, or even just several. However, for now, we'll simply put the Loyalist Committee scene in the "uncertain" category. What we do know is that, at the end of the Loyalist Committee scene, it was decided that Obi-Wan and Anakin would serve as protection for Senator Amidala. We are then given a scene, identified in the script and novel as sunset, where Obi-Wan and Anakin first meet Amidala in her Senatorial suite. Amidala's location at that point offers us some material with which to develop further clues. Note, above Typho's head, the setting sun. As Jar-Jar approaches the elevator to greet the Jedi, the furniture casts shadows consistent with that sun angle. And, given the layout of the apartment, it should be noted here that Amidala's bedroom windows face the sunset, as well. That's a rather important point. Why? Because we get to see the apartment the day after Obi-Wan leapt through the bedroom window. In the shot below, you can see the droid carrying the replacement window into position at the upper center of the frame. Though the building's many curves make analysis of the shadow angles somewhat tricky, there's a simple solution . . . just look at the reflection of the sun off of the gold area to the right of the replacement window. The sun is high, and more or less in line with the long axis of the building (i.e. the line going from the bedrooms, through the den, and out past the elevators). Given that sunset occurs low in the sky to the side of the building (and would cast all its light on the walls we're looking at above), we can confidently peg the time of the scene as being approximately midday. As you can see, the time of day is almost exactly the same as that in the Loyalist Committee scene, judging by the almost exact similarity of the light angle, which shows that the sun is off to the left. Finally, note the rather low light angle in the above scene (as per the shadows, especially on the dome structure to the right of Anakin in the first shot), several degrees lower than what we see in the latter scene at the Senatorial suite. It was definitely not yet midday. Therefore, the Anakin-Palpatine meeting scene, the Loyalist Committee scene, and the scene which occurs just before Amidala and Anakin depart for Geonosis all occur in the morning. For additional evidence, I point to the relative nearness of the Jedi Temple. First, let's take a look at the scene immediately prior to the Anakin-Palpatine meeting, in which Mace orders Anakin to go talk to Palpatine. Note the shadow angles of the roundish buildings above Mace Windu's head and to the right. As you can see, the shadows point down and to the left, from our perspective. Therefore, the Anakin-Palpatine meeting in Palpatine's office had to have occurred between rather-early-morning and midday, and the other office scenes must also have occurred in the morning. Any significant deviation ought to have been quite visible, judging by the highly variable light angles between morning, midday, and sunset. And so, we can state with confidence that Anakin and Amidala departed Tatooine right around dawn, Capital Time. Let's say that dawn on Coruscant is at 6am Capital Time, and take this figure as the approximate time of liftoff for Anakin and Amidala. As indicated far above, the Republic Senate night-shot occurred at approximately 9pm Capital Time. The most reliable indicators from Star Trek regarding warp speed (as noted on this page) suggest that warp three is 39c, warp 5 is 1460c, warp 9.2 is 9000c, and warp 9.9 is 21,400c. Though these numbers certainly aren't linear, I'd hazard a guess that 1752c rests somewhere in the area of warp 6, in the TNG scale. Even if the Millennium Falcon, fastest vehicle of the Star Wars universe, is 5 times faster than Amidala's Senatorial ship, then it would only be travelling at about 8,760c . . . somewhere in the neighborhood of warp nine. To have anything resembling the sort of speed advantage most pro-Wars debaters believe that Star Wars ships would enjoy, the Falcon would actually need to be about 50 times faster than Amidala's ship. Is it possible that in the technologically static civilization of Star Wars, the beat-up old ship of a smuggler (with its balky and temperamental hyperdrive) is over 50 times faster than a sleek, well-maintained official governmental starship of the rich and vibrant society of Naboo from 20 years earlier? Are we to simply assume that every other ship in the SW universe is that much faster? I can't imagine any good reason to do so. Previously, I'd been under the opinion that we could not know what time of night it was when the exterior night shot of the Senate (i.e. before the Emergency Powers vote) occurred. I simply assumed it was during the evening, which would thus give the Naboo ship the highest speed. "[B]ehind Mace Windu the sky is visible through a window, which is noticably darker [... b]ut a slight amber-tinge is still visible"
Though the person was a bit color-blind, they are correct. There is indeed a purple-tinge outside the windows behind Windu.
. . . and, as you can see, the sun is to the left, and the shadows of the statues are rather low, headed toward the lower right. What is the time of day of that daylight shot? Well, it occurs in TPM after Qui-Gon's report to the Council, but before Anakin is tested. Note that the building shadows in the first shot are downward, and to the right. Compare that to the very similar shot out of the same windows from Attack of the Clones, which (as established) occurs in the morning. The shadows are down and to the left. So, we've established that the TPM Jedi Temple meeting occurred circa midday or early afternoon, and the Anakin testing occurred circa sunset. Therefore, the Senate scene which occurs between those two must be occurring in the afternoon. With the shadows in that scene to the left, what are we to make of the AoTC Emergency Powers voting scene's night-shot, wherein there's a sky-glow to the right? Obviously, it must occur in the pre-dawn morning. This suggests that the exterior shot's sky-glow was it's left-most part (from the perspective of the Windu scene above). What this means is that the Tat-Geo trip actually took at least 21 hours, because we see Anakin and Amidala leave around Coruscant dawn and arrive sometime in the midst of Coruscant pre-dawn. At 3 and 3.25 light-years, respectively, that works out to a speed of 1,251 to 1,356c . . . we'll just call it 1350c for simplicity. Though I find the 1,350c conclusion solid, it occurs to me that my previous way of estimation did not allow for time-to-orbit and time-to-deorbit, given that we see the ship lifting off from the surface of Tatooine, and then flying low over the surface of Geonosis. Though I find it unlikely that both procedures took three hours each, I will continue to employ the 1752c value (from the 15-hour time factor) for the scene, as a generous upper limit. And again, note that I am not claiming that all hyperdrives max out at 1,752 times lightspeed. However, it does put certain rational limits on what the maximum speed of, for example, the Falcon's hyperdrive could be. A handful of weak objections appeared to this. They are addressed here.